Three words – one big meaning. 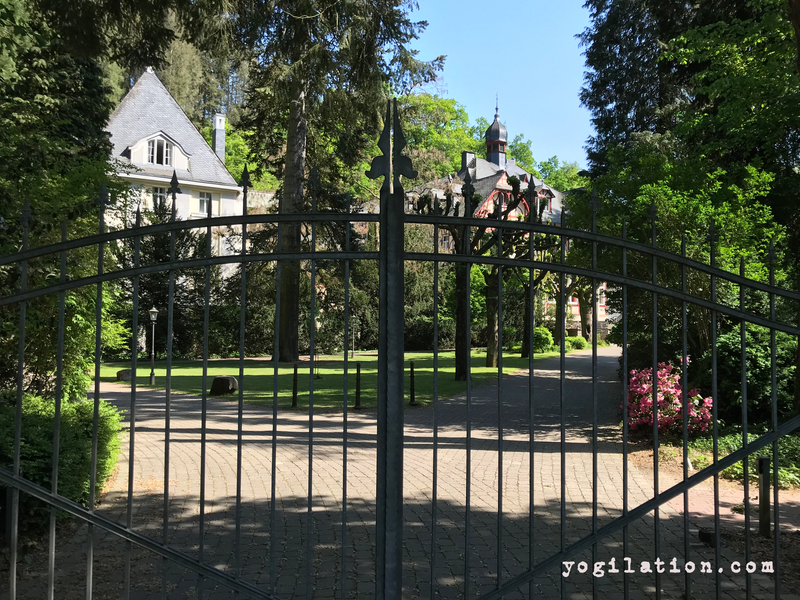 A meaning that I knew, but only after four days at the Ayurveda Parkschloesschen in Traben-Trarbach, I finally understood. Ayurveda is something that pretty much all of us have heard before. Some people think it’s a strict diet, others think it’s a dogmatic lifestyle. Well, let me tell you this: You’ll be surprised about how much of Ayurveda you’re already doing in your everyday routine. And if not you, then definitely your grandparents or parents. 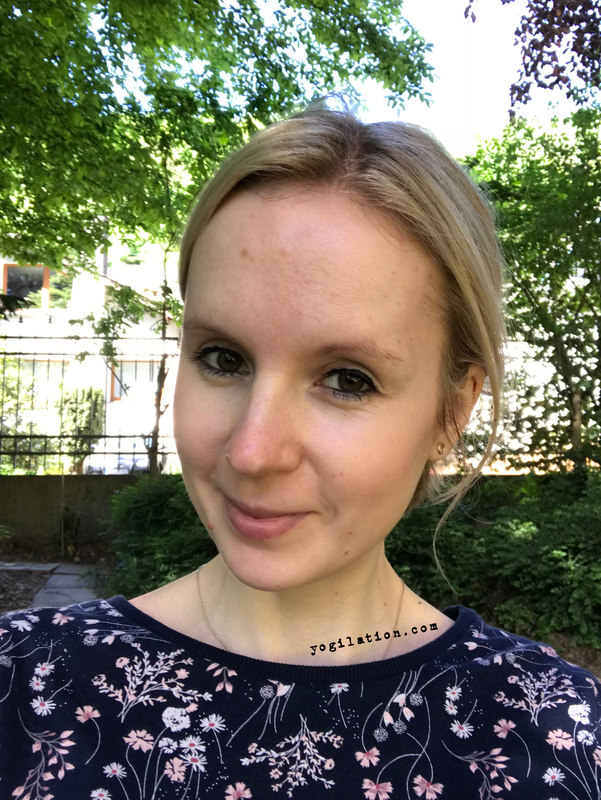 I’ve been facing quite a few challenges with my stomach and hormonal imbalance over the past year. The latter even so severe that a hormone therapy seemed to be inevitable. However, if you’ve been following my blog, I try to avoid medication as much as I can, and use it only if that’s really the last resort. So, I read a lot and explored different ways to find “hormony” again. What I really like is that there is no “one fits all” mentality – people are seen as unique, therefore every treatment is individual and holistic, which absolutely aligns well with my beliefs. I was intrigued. 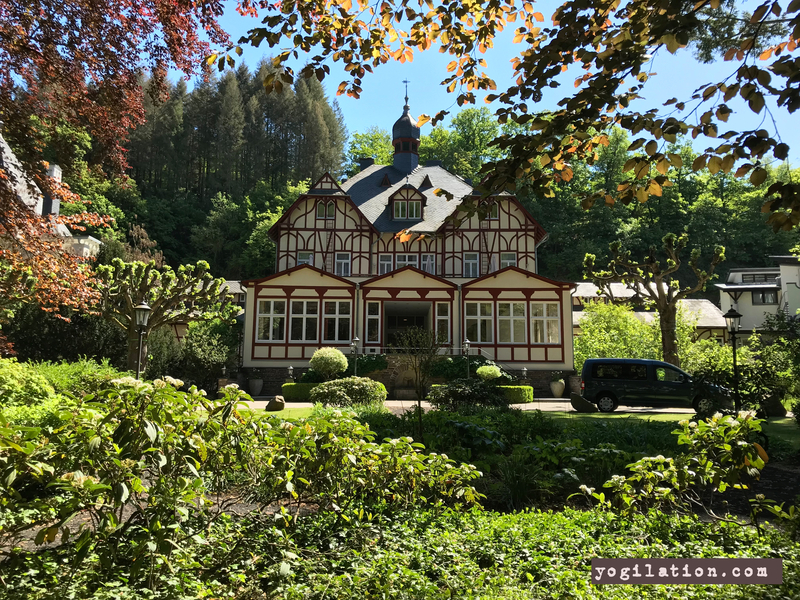 I consider myself very lucky to have had the opportunity to learn more about Ayurveda at the Ayurveda Parkschloesschen in Traben-Trarbach. I won’t forget the moment when the hotel shuttle stopped in front of a big gate; opening up to a huge park with lots of big trees, beautiful flowers and plants. It looked all so surreal, but it wasn’t. I just arrived at the Parkschloesschen (translated: park castle), literally! Here I was. No internet connection and barely phone reception. I admit, it wasn’t easy at the beginning, but then turned out to be so relieving! 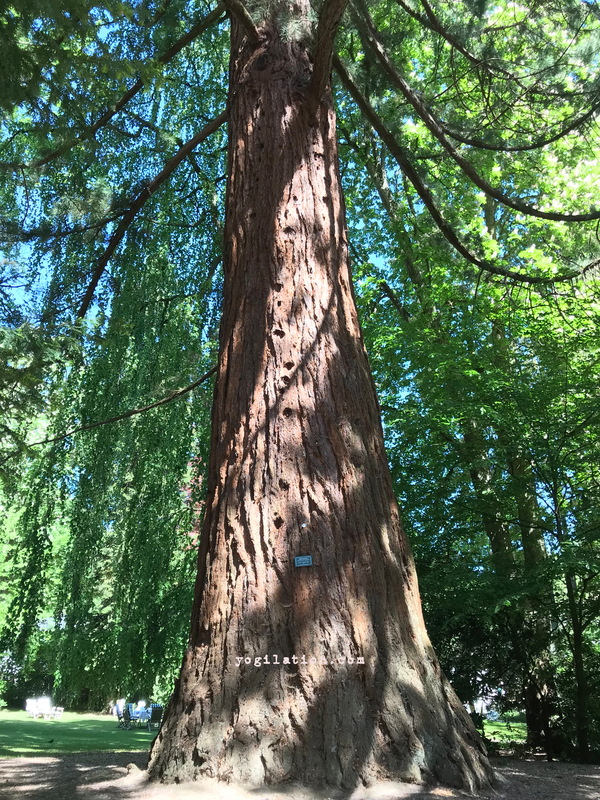 My room was amazing – full of light and when I opened the window, I was able to listen to the birds singing, and the babbling brook running along the park. That’s what I call pure meditation! However, this wasn’t the only ‘music’ in the room. Every room was equipped with a sound system with classical music or another channel with recitations of vedic sankrits. Of course this wasn’t a coincidence! 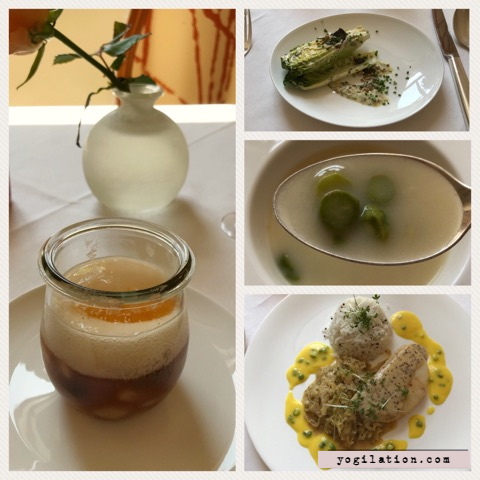 One of my definite highlights at the Parkschloesschen was the Ayurveda cuisine! Several experienced ayurvedic chefs prepared all meals fresh – every single day. Mostly regional and seasonal organic food is being used in the kitchen to design the wonderful and delicious dishes for all three meals. 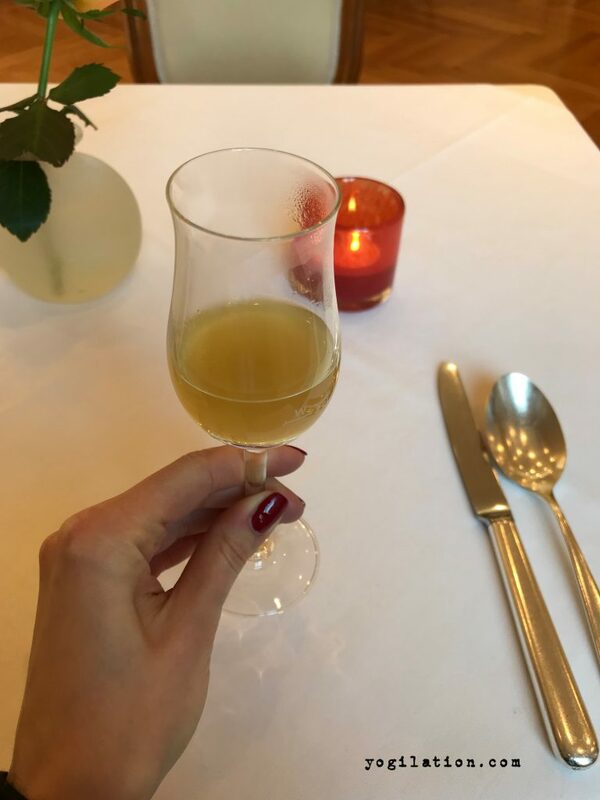 At the Ayurveda Parkschloesschen, you begin a meal with a small digestive drink made of fresh ginger and cumin to get your Agni (our digestive fire) started. This is followed by dessert. Yes, exactly! In Ayurveda, dessert is not forbidden, it should only be eaten before your appetizer or main dish, because sweets (fruit e.g.) and dessert is hard to digest. So, when you start with dessert, your metabolism – your Agni – fires up immediately and you won’t feel so heavy and tired at the end of the meal. The main meal in Ayurveda is lunch, because that’s when we digest and convert our food best. Breakfast is usually made of a warm porridge and fresh fruit or compote, depending on your Dosha type, and dinner is mostly light, for example in form of a soup. Something I’ve learned is that it’s not recommended to drink during or after a meal. Because it inhibits our digestion by watering down or gastric juice, which in turn prevents our bodies from using all valuable nutrients of our meal. The recommendation is not to drink anything 30-60 minutes after a meal. The food in our meals contain enough water already, so there’s usually no reason to drink additionally. 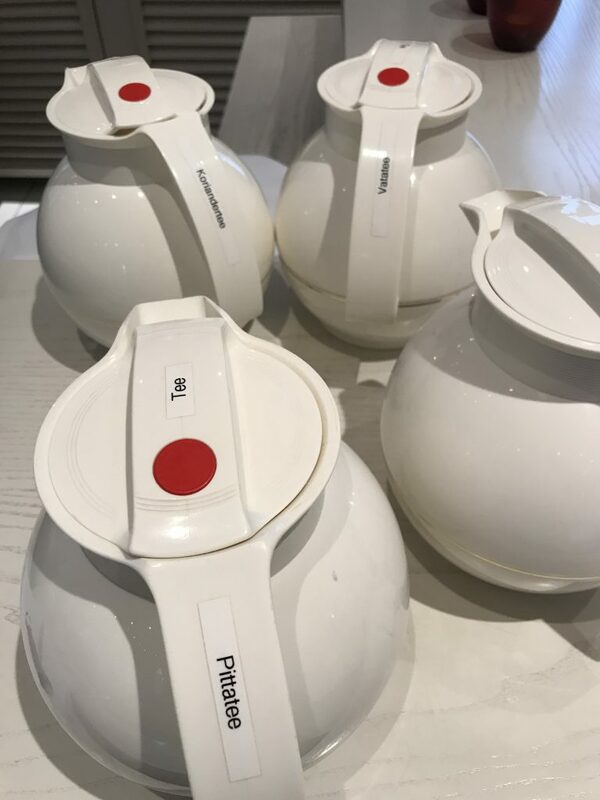 In between meals, it’s best to drink warm water or herbal tea, and (of course) the Parkschloesschen provided herbal tea and hot water all day (and night) long. … because it’s neutral and cleanses toxins out of our bodies much better than cold water. Water has its density maximum at 4 degrees Celsius, so the warmer it gets, the less volume it has. Therefore our body can make better use of it. I’ve been doing this ever since and I feel much better indeed. No bloating, no stomach aches anymore. Definitely worth trying! The goal of Ayurveda is simple: to stay in balance in all aspects of life. Being in balance means good health and feeling good. However, keeping this homeostasis is only possible when we stay in touch with our own nature internally as well as with the external nature. Those five elements are being grouped into three basic types of functioning principles: the three Doshas. Each one of us has all three, but usually only one (or two) dominate Dosha(s), which determine our physiological and personality traits. In order to know my dominant Dosha, I went to see an Ayurvedic practitioner for the Ayurveda pulse reading in the morning of my second day. Definitely an interesting experience! Two measurements are being done during the pulse reading: Pakriti, which is what we are born with and our basic physical constitution. The other one is Vikriti, the part which got out of balance. In my case, I am a Vata-Pitta, but my Vata is currently too high, thus out of balance. After determining my Pakriti and Vikriti, my Ayurvedic practitioner subscribed two Ayurvedic treatments: a synchronous massage and a Padabhyanga. The latter is a foot and leg massage for deep relaxation – perfect when you’re stressed and need to calm down. The synchronous massage was certainly an adventure, because I’ve never been to a massage done by two massage therapists at the same time. This technique activates both brain parts and leads to deep relaxation and detoxification. The massage ended with oil poured onto my forehead for 20 minutes. This procedure calms the entire vegetative nervous system, usually used to treat neuro-vegetative disorders and stress-induced symptoms. Yes, I can say with complete self-confidence that those treatments were wonderful and more than I’ve ever expected! 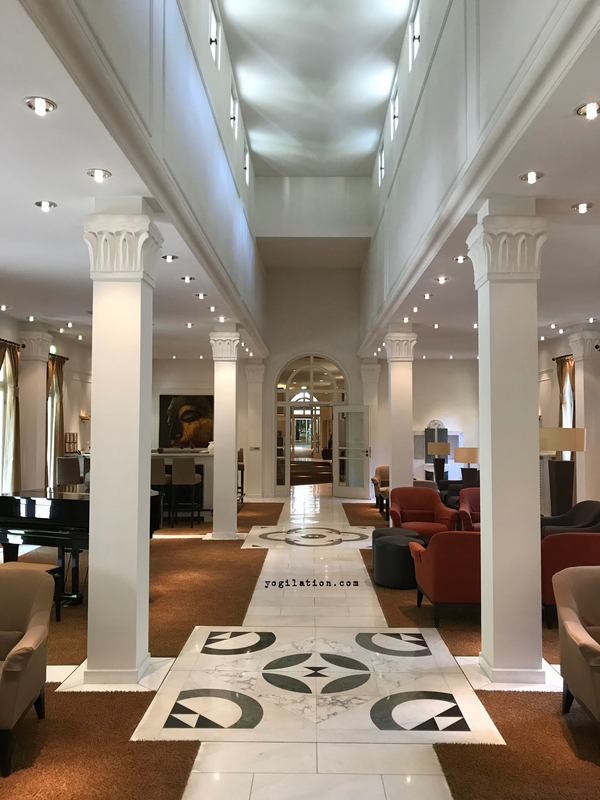 I’ve been to many massages all over the world before, but those ones at Ayurveda Parkschloesschen were definitely the best. I was particularly amazed by all the little details that they paid attention to. For example, heated blankets or special oil removing shampoos. Also, individual quiet rooms for relaxation after a massage, including a private bathroom and shower, in order to be able to wake up and get ready at your own paste. No stress. No fuss. Total privacy. A-mazing! What would finding your balance be without Yoga? 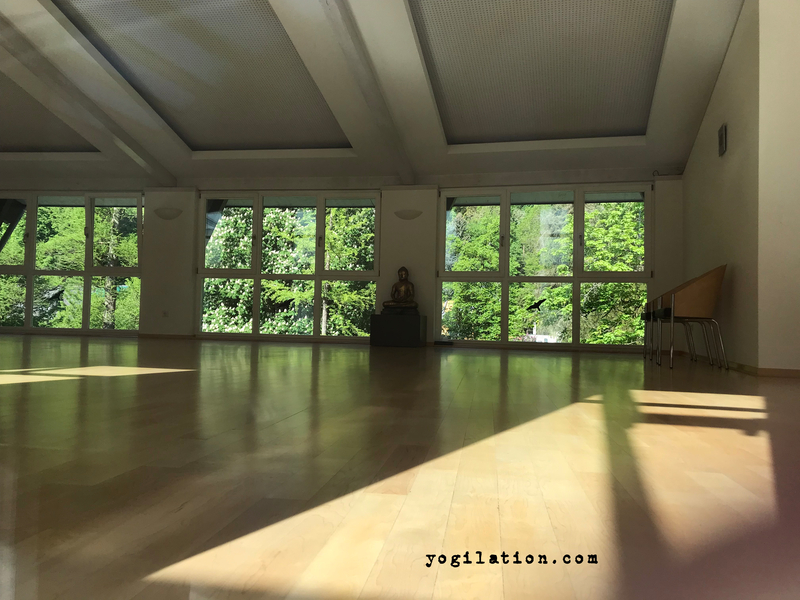 So, there are two free yoga sessions at the Parkschloesschen every day to support the goal of Ayurveda: to find balance, and to help our body during detoxification. I’ve learned so much in only four days at this wonderful place that I could go on writing a whole book about my stay. The entire place is therapy with its huge park and garden, the very nice and knowledgeable personnel, the amazing vegetarian Ayurveda cuisine, the experienced Ayurvedic physicians, Ayurvedic massage therapists, yoga instructors, and interior design of the hotel. 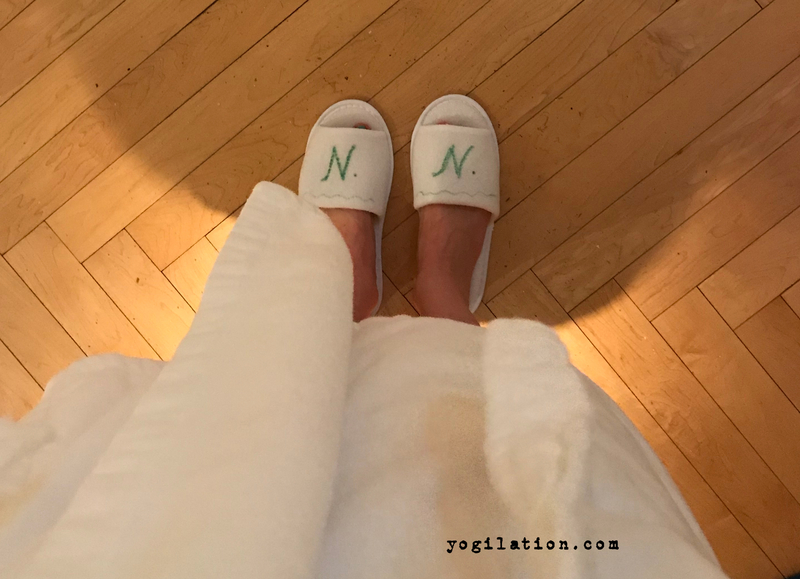 I’m still new to Ayurveda, but that moment when my Ayurvedic practitioner said that I’m already doing a lot of things right, I knew that everything really is Ayurveda. Over the past year, I’ve been practicing to listen to my body and to what makes me feel good. For example, by going for walks in the evenings, by practicing yoga, or by eating warm meals three times a day. So turns out, without even knowing my Dosha, I already did what is recommended for my Dosha type Vata. One of my dreams to do some day in the future is a Pancha Karma treatment – also called the “Royal Ayurveda Therapy.” I’ve talked to guests at the Parkschloesschen who treated themselves to this (minimum nine day long) therapy, and they absolutely recommended it. Now I started to drink more “Vata” tea to decrease my Vata, because you should drink the Dosha tea which you need to decrease to bring it all back in balance. Cooking: I pay more attention to the oils and spices I use. For example, I started using Ghee for frying my veggies. I drink warm water during the day. I still eat my beloved grilled salmon or scrambled eggs for breakfast on weekends, but that’s the great thing about Ayurveda – it’s not dogmatic, there are no rules. Everything is Ayurveda – as long as it makes you feel good and keeps you in balance. Hi Anne, Thank you for your comment! You are totally right! Thanks for letting me know! I appreciate it! 🙂 Stay yogilated!